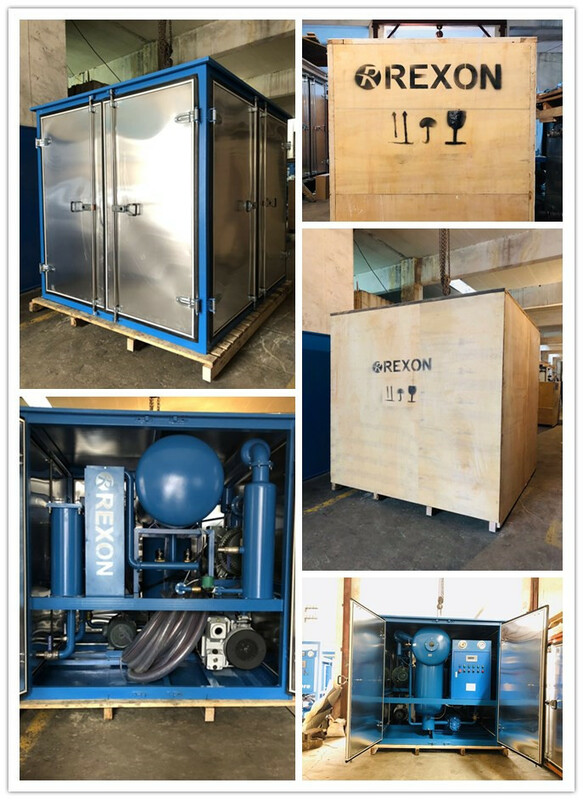 Our REXON double stage high vacuum transformer oil purification system ZYD-150(9000LPH) and the vacuum pumping set RNVS-70(70LPS) were just finished for packing and delivery in factory. These equipment were purchased by overseas customer who are doing project with new power plant, which will have a lot of big transformers. Besides this, they also purchased the oil BDV tester for transformer oil’s break down voltage testing. Our transformer oil purification system and vacuum pumping system take the newest and most advanced technology in China market. We only take the first class standard components as the main parts to build our machines, we are not only focus on the newest and reliable oil filtration and oil purification technology, we are also focus on the components which will decide the machine quality and performance. Only under both cares, a truly perfect oil purifier machine will be built. Welcome to contact us for more details. We will be always available there for you!